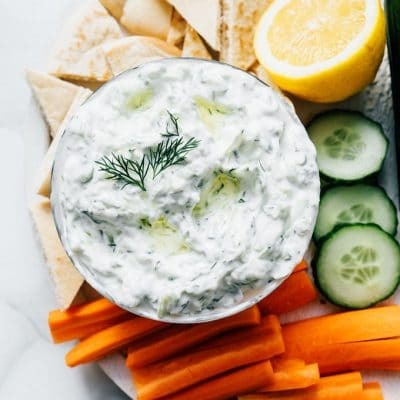 This is the best tzatziki recipe! Refreshing cucumber, creamy Greek yogurt, and zingy lemon make it the perfect condiment for just about everything. Thicken yogurt: Strain yogurt using a cheesecloth or paper towel for 30 minutes to 3 hours to remove excess moisture (can skip this step if you're in a hurry). Prep cucumber: Meanwhile, sprinkle a pinch of salt onto shredded or diced cucumber and spoon into cheesecloth or paper towels. Let sit for a few minutes then wring it out to draw out moisture. Mix: Mix together yogurt, cucumber, dill, garlic, and lemon. Season with salt and pepper to taste. Add a touch of extra-virgin olive oil for flavor and shine. Serve with pita, veggies, on Roasted Chickpea Gyros, or really anything! The flavors become less tangy as you let them sit, so your tzatziki might just be best the next day. The gift that keeps on giving. Recipe from Live Eat Learn at https://www.liveeatlearn.com/tzatziki/.